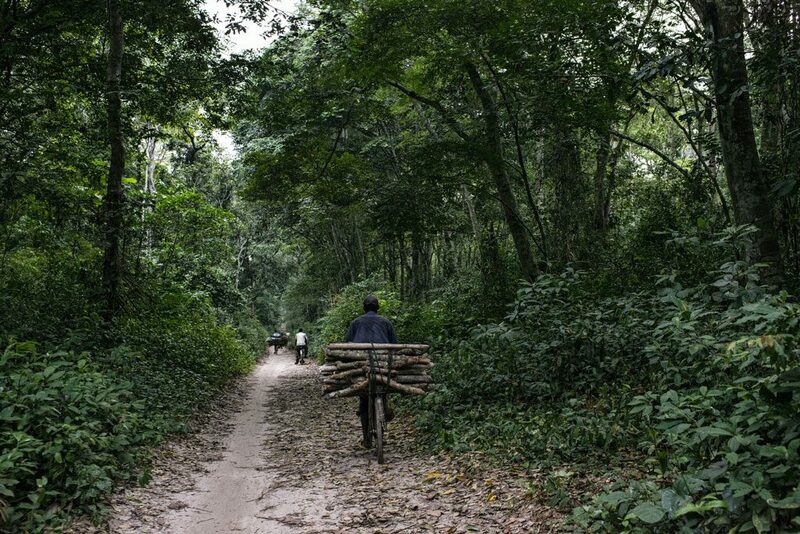 How do you distinguish between cyclical farming and deforestation in the Congo Basin? A new Global Forest Watch map can now help make this distinction. Forest loss is a major concern for conservationists dedicated to protecting the Congo Basin, the planet’s second-largest tropical rainforest. Data like tree cover loss on Global Forest Watch help monitor changes in forest landscapes like the Congo Basin, but without other contextual information, it is difficult to know how much of that loss is true deforestation and how much of it is the result of cyclical land use practices. New research by the University of Maryland’s Global Land Analysis and Discovery (GLAD) laboratory gets us closer to that answer. On the way from Kisangani to Masako village. Democratic Republic of Congo. Photo by Ollivier Girard/CIFOR. The study shows that 92.2 percent of tree cover loss in the Democratic Republic of Congo (DRC) and 48.2 percent in the Republic of Congo (ROC) is linked to small-scale shifting cultivation, also known as slash-and-burn or swidden agriculture. Rapidly growing populations in the two countries have driven rapid expansion of cultivated land in the region, increasing pressure on the Congo Basin forest. Shifting cultivation has been the predominant farming practice in Central Africa for centuries where soil quality is poor and farmers do not have access to alternative means like fertilizers. After clearing the land and farming for a short period, farmers allow secondary forest to grow and soils to regain productivity during what’s known as the fallow period before clearing and replanting the land. This system results in what researchers call the “rural complex,” a mosaic of forest patches, cleared land, active fields, fallow fields and land used for other purposes, such as logging. This constantly changing mish mash of land use types makes it exceptionally difficult to map forests and monitor deforestation using only satellite-based data. Using what limited data are available on small-scale agricultural land use in the Congo Basin, the GLAD team mapped the rural complex of DRC. They used forest fragmentation to differentiate between the rural complex, fragmented forest and undisturbed forest. They also determined the amount of actively farmed land, fallow land and forest within DRC’s rural complex. Taking stock of these areas helps us understand the patterns of shifting cultivation as well as the rotation period, which indicates how intensely the land is used. Shorter rotation periods usually result from higher demand for cultivation and leads to fewer trees, worse soil quality and expansion into primary forest. World Resources Institute’s Congo team recently replicated GLAD’s methods to map the rural complex for the Republic of Congo. This work was carried out to inform the ongoing national land use reform process in ROC and was financed by the CARPE program, a U.S. government-funded conservation initiative.